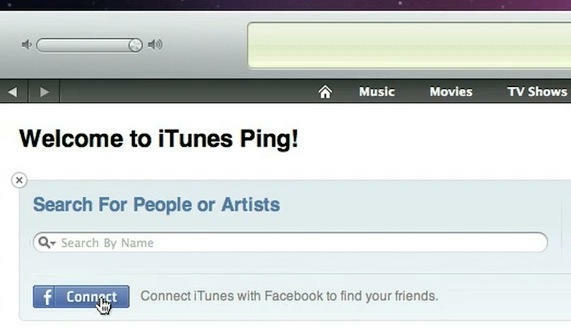 iTunes Ping And Facebook: What’s Going On? It seems the situation is more confused than I thought; some people have been able to connect Facebook with Ping, and other haven’t. See end of post for a number of updates. OK, I give up. I’m confused. I have no idea what’s going on with Ping and Facebook. On the one hand, we have the above screenshot, taken from Apple’s own Ping web page just this morning. It clearly says you can connect Ping to Facebook. But. You can’t. At least, I can’t. I’ve hunted through every single corner of the Ping pages inside iTunes. I’ve looked in the Account settings, I’ve edited my profile, and there’s nothing. There’s no way I can find of connecting Ping and Facebook. I’m not alone, either. There are plenty of people saying the same thing on Twitter. On the other hand, we have this report from Kara Swisher, which confirms the lack of Facebook integration inside Ping, and quotes Steve Jobs saying that Facebook’s terms were “too onerous”. 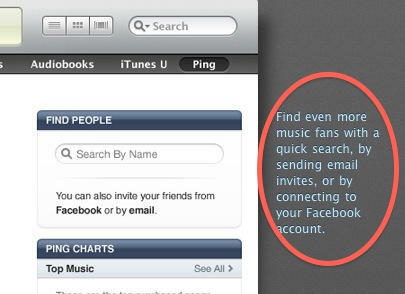 So why does Apple’s own web page still say “Find even more music fans with a quick search, by sending email invites, or by connecting to your Facebook account.”? My conclusion: I think Facebook’s terms only became onerous at the last minute. And the Ping web page is going to be edited very soon. UPDATE: Well, this is weird. It seems that some people have been able to link up iTunes and Facebook, and others haven’t. See the comments for details. But if the two services are linked up, why did Steve Jobs tell Kara Swisher that Facebook’s terms were too onerous? Strange. UPDATE 2: Dan Frommer has noted the same issue.